Weebly is a very accessible and easy to use website builder, ideal for a personal project, blog, portfolio or small business. For those that don’t have a lot of experience in website building, but need to get themselves a presence online that looks good and works well - without too much fuss - Weebly is the tool. Weebly is a very accessible and easy to use website builder, ideal for a personal project, blog, portfolio or small business. For those that don’t have a lot of experience in website building, but need to get themselves a presence online that looks good and works well – without too much fuss – Weebly is the tool. At the heart of Weebly’s offer is their e-commerce functionality which, combined with its easy accessibility, makes it one of the very best website builders for the small business owner or service provider. 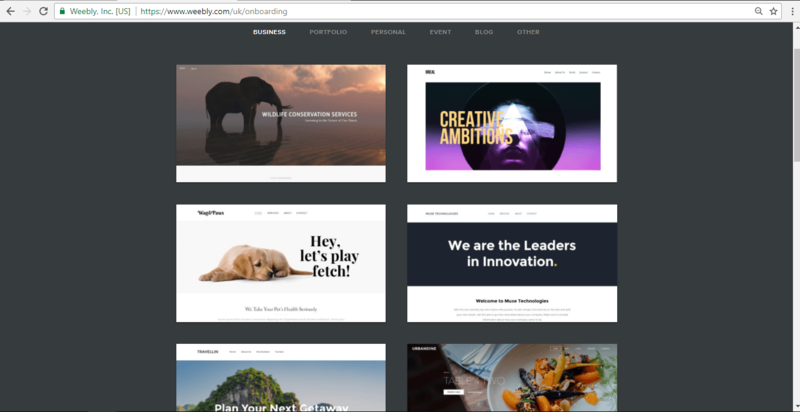 Weebly provides a portfolio of ready-coded, slick-looking templates for a very wide range of business and personal projects. The template options are headed under Business, Portfolio, Personal, Event, and Blog, meaning they cover a significant proportion of potential user requirements. The template offer is very much in keeping with the simple, accessible ethos of Weebly – I don’t feel overloaded with options and don’t have to scroll through an exhaustive list. Many of the templates come pre-populated with the details of existing businesses. There is a more than adequate level of variety without leaving the user suffering from with choice overload. Before creating the website, you are given the option to preview it, meaning it is almost instantly loaded up and you can run through all of your proposed site’s content. This makes things a lot simpler, as you will not have to go through the tedious process, as I have with other builders, of having to load out a template in order to get a full vision of what it includes. This is especially important for those looking for a fast and hassle-free process, since it is impossible to predict, just by seeing a template home page, whether the structure of the rest of the site will suit you. Once you’ve chosen the layout that looks best suited to your needs you can load it up and begin editing it to your tastes and swapping in your business information. The simplicity of the drag-and-drop interface, as discussed above, makes this very easy and allows you to quickly adapt the template to your particular requirements. Search Engine Optimization: SEO support is offered to some extent across all levels of the Weebly pricing plan, which is an impressive offer, to say the least. Besides the standard SEO options such as delineated page titles and descriptions and customizable URLs, Weebly’s blog offers a comprehensive checklist of the route to a properly optimized site. From brainstorming and planning (using tools like the Google Keyword Planner) through taking action on each of the individual elements like page titles and URLs, the guide makes the subject accessible to all. The range of SEO apps offered as integrations is very impressive- offering tools like SiteBooster and Positionly. Free SSL Certificates: This is another offer that is available at all levels. Having Secure Socket Layers (SSL) certificates are an increasingly important feature for the modern website. SSL technology ensures the security of the link between your web browser and the website you are visiting. When the small padlock icon appears as locked in the left-hand corner of your address bar, this is letting you know the site has SSL certification and you are secure in visiting it. SSL is vital not only for security but also for data privacy and site authentication. As well as important to an increasingly broad section of web users, there are definite benefits from an SEO perspective- Google has recently suggested that sites with these certificates could be in line for a ratings boost – appearing higher in search rankings. Site Analytics: All Weebly packages offer site analytics to some degree. However, more advanced options are available as you move up the levels. Weebly offers a range of analytic measures – from the basic elements like site visits and page views, through to more advanced tracking, like referring sites and search terms. Referring sites tracks which sites send the most visitors to your website, while search terms rank the most common entries into search engines. Your analytics have a dedicated center, where they are laid out for analysis, with statistics like website visitors represented graphically. Mobile Optimization: Not only are the sites you build on Weebly optimized for appearance on mobiles and tablets when accessed by users, but you are able to build websites on the move with their mobile app. Impressively they offer this function not only for basic web-building capabilities but also for blog and e-commerce options. E-commerce is at the heart of Weebly’s offer and is quite literally front and center. When you first sign up to build your site, you are asked whether you need an online store. If not, you are taken to the templates section. But if you do, then building the store is the first thing on the agenda and you will be taken to the dedicated hub within the build and edit menu, where all of the e-commerce options are managed. Here you can add all of your store information, list products, set up shipping options and taxes, with many other options besides. All of this can be initiated before you launch the website, meaning you can have a fully-optimized and prepared e-commerce function built-in right from the start. For many website builders, the e-commerce section is almost an after-thought, something to be tacked on to the end of a functioning site – but Weebly truly builds in this element right from the start. The e-commerce hub is presented to you when you begin set-up of your online store and breaks down each of the elements required to get your store functioning into manageable steps. 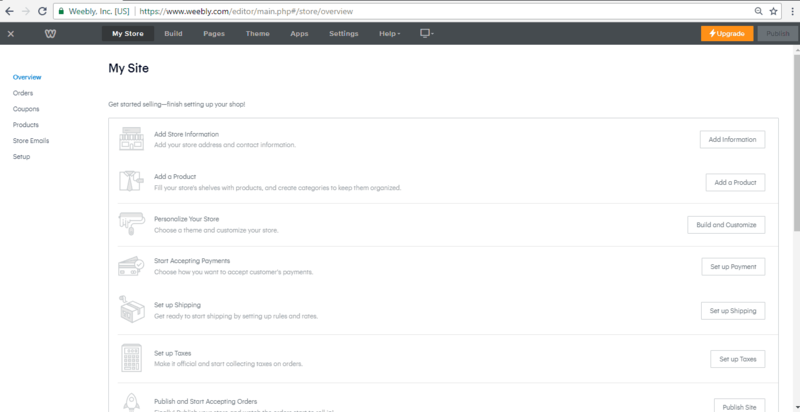 Weebly takes you through the process of setting up payment options for example, in a step-by-step process which is replicated across all of the key action points. I have found Weebly’s interface to be among the easiest to use of any website builder. Everything can be grabbed at the click of a button and moved around the page. Sections are quickly added or removed, with inserts like text or images again a simple matter of dragging across from the menu on the left-hand side. You can easily drop in anything from a block of text or a button, through to newsletter forms, maps, and slideshows. Once added, each new element updates in real time, meaning no need for constant flipping through menus or saving every minute. As they appear on your page, you simply have to click on each new element to produce an individual sub-menu for that item, with a range of options on content, size, appearance and much else besides. Individual additions are easily moved around the page, swapping orders and positions by dragging and dropping. The Weebly menu has a very extensive range of options for building a site that really reflects on you, your product or your service. You can easily embed high definition videos, audio, YouTube content, as well as all manner of files, with the drag and drop interface. While many builders offer drag and drop, they do not necessarily cover the range of options that Weebly does within that functionality. Dragging in surveys, social icons, quotes and search boxes is just as easy and readily accessible as adding text boxes and basic images. Weebly’s support offer is as good as I have seen in a website builder. It is based around a dedicated help center, featuring a large library of help topics, laid out along eight key subject areas, including e-commerce, building your website, and email marketing. Each of these breaks out into a range of articles focusing on key sub-sections. The e-commerce section, for example, features 12 sub-headings like “getting started with e-commerce” which themselves split out into further areas of focus. In short, there is a wealth of pre-prepared guide and article-based support to start you off. Alongside these, there are also pre-recorded webinars taking you through subjects like a beginners guide to Weebly and how to build an online store. If the library of material doesn’t answer your question, you can turn to the forum for support. Here, as well as posting your own questions for answers from other forum users, you can scroll through an enormous catalog of posts, on all manner of help topics. The thread “Using Weebly” has over 9,000 posts at the time of writing and so I imagine the vast majority of questions have already been answered somewhere within this abundance of information. Failing both of these options, you have the option of directly contacting Weebly support staff – using a range of approaches. You have the option of submitting a support ticket, dealt with through your email account. Then there is the option of live chat – I asked a question via their live chat at midday on a Sunday and received an immediate response from a named staff member. They resolved my issue in less than a minute – the experience was very impressive. The email option may seem to have less purpose in light of the availability of live chat, but I think this option is reserved for more complex queries requiring some screenshots and similar media. Finally, for those really in need of coaching through an issue, there is phone support, available within working hours, U.S. Pacific Time. Weebly’s pricing structure is laid out along four main options, the first being the free package with basic functionality, best suited to experimenting and familiarizing yourself with the technology and the interface; you will only be able to publish with a Weebly sub-domain, as is the case with almost all builders. You get almost all of the build functionality (minus a few premium options like video backgrounds) with the drag and drop interface. The free package requires Weebly ads to be displayed on your site, but comes with 500 MB storage, SSL Security, SEO, access to a forum as well as chat and email support. The next step up is the first paid option, Starter package, which alongside all features listed above, allows you your own domain with unlimited storage. At a very affordable rate, this package option is ad-free and comes with site analytics and e-commerce options. In terms of e-commerce, the starter package allows you to list up to ten products, and provides a checkout feature, although you will pay a 3% transaction fee on sales. Users with more significant e-commerce needs will want to opt for one of the two higher-end packages. The first of these is Pro, which is a minimal amount more expensive than Starter, but comes with many more features including site search options and password protection for certain areas of the site. Pro also comes with HD audio and video options, alongside up to 25 listed products as part of your e-commerce offer and phone support. An interesting addition at Pro level is the ability to build a membership website, restricting content to paid or subscribed members- an excellent option for those selling online learning content for example. The top-level plan – Business – is for serious online sellers and comes with some very powerful e-commerce features. This plan is particularly interesting to those selling intellectual property, made up of zip files, songs or e-books. The Business package provides inventory management options, allowing you to centrally log and track stock, informing customers when certain products are out of stock. Other interesting features include product reviews, which will include automatic prompts sent to customers after purchase, reminding them to leave a review. You will also be given the option of registering users directly on your website, as well as calculating all of your tax and shipping centrally. The process from opening an account to having a website up and running is very speedy. If you have your website copy prepared and a fairly good idea of how you want the finished product to look and providing it is fairly straightforward, the process can take minutes. Options and choice points are kept to a minimum, meaning the process is only as complex as you need it to be, based on your individual requirements. For example, I had a good idea of the function and much of the content pre-prepared for my site when I began and so was able to have a functional site ready to launch in forty-five minutes. The real standout features from Weebly are the depth and quality of their e-commerce provision, along with the accessibility and ease of use. Combining this with a very comprehensive and highly responsive support offer, Weebly is ideally suited to the entrepreneur/small business owner demographic. The Search Engine Optimization and site analytics features round out a very strong offer- you can build a website that will stand out, monitor its progress closely, and track the impact of the changes and upgrades you make. I found Weebly to have a very comprehensive set of tools while still remaining both simple and intuitive. Wondering how Weebly stacks up against other Website Builders? Enter any other Website Builder and we will give you a side-by-side comparison.